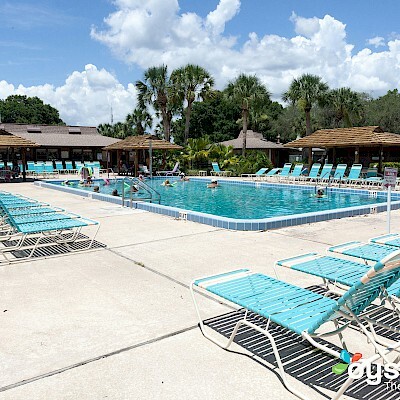 Tennis has long been an important social, recreational and competitive activity at Cypress Cove. Five courts are in use daily with both informal and organized play. Three Fun tournaments are scheduled for during the winter months. New guests and residents are welcomed with open arms, and quickly assimilated into the tennis community. Play Open Tennis daily at 1:00 PM. 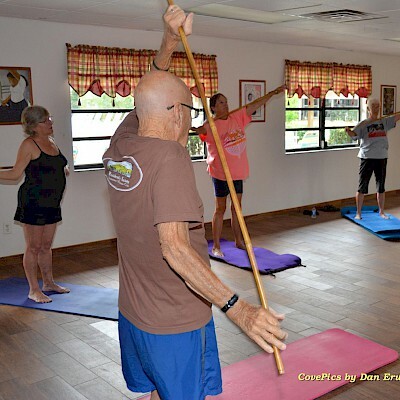 Cypress Cove hosts 4 dedicated, regulation Pickleball Courts. Pickleball is a fun, low impact, fast action paddle sport, like Ping-Pong played at a human scale! Quick to learn and easy to master, we play Pickleball year-round on two specially lined courts at Cypress Cove, with an active and growing roster of players. Pickleball is the fastest growing team paddle sport in the country! Play Open Pickleball daily at 9:00 AM. 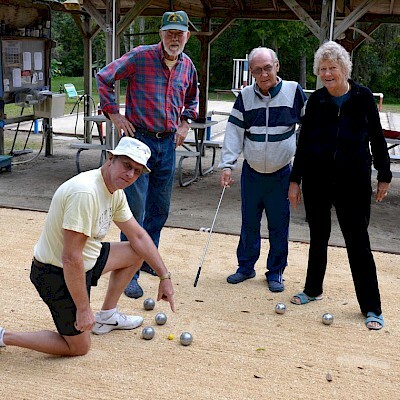 The Petanque complex at Cypress Cove consists of six courts and a large shelter with picnic tables, near the golf cart rental shop. Games are scheduled for two different times daily and informal games are welcome at any time. Petanque is extremely simple, just like Bocci. There's a target, and you have to get as close to it as possible. New guests and residents are welcomed with open arms, and quickly assimilated into the Petanque community. If you’ve never heard of Petanque, we welcome you to stop by at one of the scheduled times to try the game. Loaner boules or balls are available at the courts. Our 9-Hole Chip ‘n Putt golf course is located between the campground and the tennis courts. The longest hole is about 44 yards. 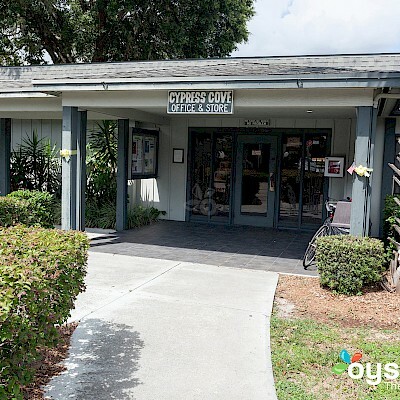 The course is managed by the Cypress Cove Golf Association, who puts on occasional fun tournaments and events. Play Open Golf daily at 3:00 PM. Enjoy beautiful, modern campground amenities. There are full hookups with concrete pads at most sites. 100 amp electric service is available at all sites. Free wireless internet & free cable TV are available throughout the RV park. 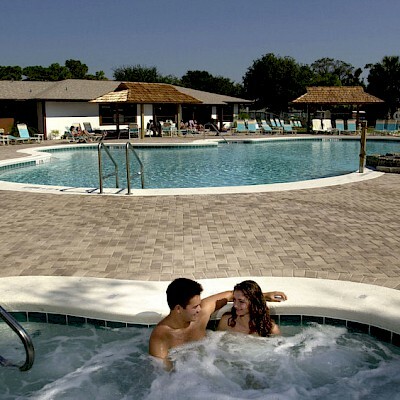 Convenient nearby bathhouses with showers, a community sink and laundry facilities. Volleyball has long gone hand in hand with nudist resorts. We have one permanent court available for play year 'round. Cypress Cove also hosts two annual Co-Ed Triples Grass Volleyball Tournaments, in May and October. We set up 4 grass courts and play a 2 day tournament with multiple divisions. Check the calendar for details. Natural Florida beauty at it's finest. Swim or boat in a 50 acre private natural lake. Spot wildlife and enjoy spectacular views. Enjoy delicious meals and breathtaking lakefront views. Dance the night away with fantastic professional entertainment. Dress up and have a blast at one of our frequent themed costume parties. The Lakeside Restaurant will be your main dining and evening activities hub at the resort. Get back to nature. 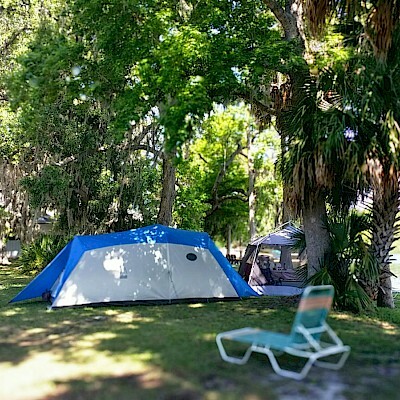 Guests are welcome to tent right on our beautiful wooded lakefront. A nearby bathhouse features a community sink and outdoor showers. Fire up the grill, or bring your own. Tent sites are always available, even without a reservation! The American Nudist Research Library, or ANRL, is an independent research library located right in the pool area. The library is run entirely by volunteers. They are currently embarking on an ambitious scanning and digital preservation project in an effort to preserve our collective nudist history. They are supported by volunteers, donations and memberships. Stop by and see what they have to offer. Let our dedicated Office staff take care of your every need. The Office also features a small Grocery and Gift Shop for staples like soda, beer, snacks, and ice. Grab a souvenir towel or t-shirt. There is an ATM Machine inside and Community Computer on the Terrace for checking email or printing boarding passes. The Terrace is a community room available for guests and club meetings. Looking for more than a day? Wonderful! Our 84 Villa Hotel Rooms and Apartments are clean and comfortable. We're especially proud of our newly remodeled rooms. We feature amazing deals like every 7th night free, and the 3rd week free in the low season. Rooms often fill fast for popular events, so book early! Stay in shape on your vacation at our poolside fitness center. Body Works hosts a variety of equipment including cardio, free weights and Life Fitness cable machines. Use of the gym requires a signed waiver and a nominal fee. This helps us keep the equipment clean and in top condition! Sign up at the Office. Shop right by the pool at the Fig Leaf Boutique. Select from hundreds of sarongs, resort wear & souvenir apparel, sandals and jewelry. Get a gift for yourself or someone you know! Located by the West Pool, the Gameroom offers pool, ping pong, puzzles & board games, and a community TV. A great spot to relax and get out of the heat for a few minutes. It's also where the Camera Club presents their annual Photo Show! Pamper yourself at Nature Hair, a full service hair & nail salon located right at the West Pool. Hair, nails, pedicures... they do it all! Drop in anytime to visit our uniquely natural Hair Styling atmosphere, or call 407-870-5131 (extension 2613 from your room) to book an appointment. Younger kids will enjoy our poolside playground. We have a large covered playground with 2 Little Tikes play structures, including a small one for very young children. The Clubhouse is our main community room. It is used daily for exercise and dance classes. We have BINGO there on Tuesdays. It is also home to a small community library. The Clubhouse may be reserved for private parties as well. Just talk to the Activities department. The East Pool was our original swimming pool added in 1980, but it is still popular today. Considered the "quiet" pool, it's a great spot to relax, read a book, or play a game with friends. We hold water exercises in this pool. It's also great for laps due to it's rectangular shape. What could be better on your vacation than a poolside massage? Located at the West Pool, Silver Lining Massage offers traditional massage, acupuncture, facials, hot stone massage, bamboo massage, body scrubs, body masks, B12 injection therapy, and aromatherapy. Dial 2603 from your Villa or reach us at 407-518-2603 to book an appointment. Located at the West Pool, this open air hot tub is a very popular spot. Let the heat relax your muscles while you meet new friends. Hot tubs are great conversation starters! Rest Yours at Ours! Cheeks is our poolside bar & grill, located right in the heart of the pool area. 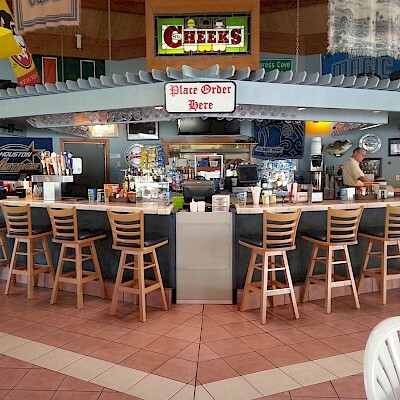 With a full liquor bar, great menu, large screen TVs, specials and activities, you are sure to spend a lot of time at Cheeks. Open all day long for breakfast, lunch & dinner, Cheeks is a great place to relax and meet new friends. Located at the East Pool, this large enclosed hot tub is a great place to socialize. There's a shower right in the building, so you never have to walk far to rinse off. This hot tub is especially busy in the evenings and after a dance. It also features a lift for accessibility. The West Pool is probably where you are going to spend most of your time. A beautiful, free form pool with no deep end and seats along the edge, it is built for socializing. Add a music cabana and weekend pool parties all summer, and this is definitely the place to be. Come early to get a lounge chair! Relax on a hammock and enjoy a cool lake breeze. The lakefront is beautiful, natural and inviting. It's also quiet and a wonderful place to curl up with a book, or even catch a nap. Swim at your own risk. Enjoy a relaxing boat ride around the lake. 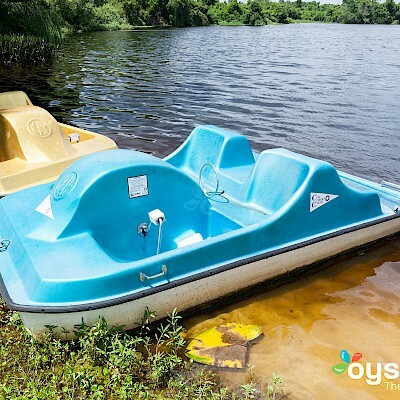 We have pedal boats, a canoe and a kayak, all absolutely free for guests of Cypress Cove. Spot wildlife in a natural Florida setting. 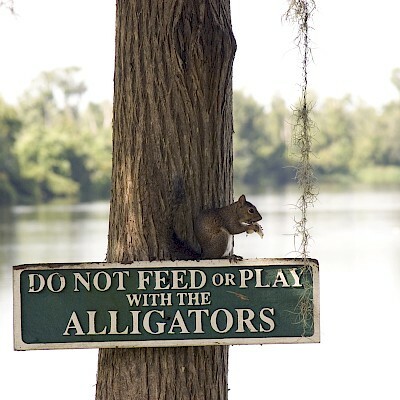 You might even see an alligator! A fun, nautical themed bar located inside the Lakeside Restaurant. Enjoy fun group trivia games during Happy Hour. Sing Karaoke at one of our frequent Karaoke Parties. Or just saddle up to the bar and enjoy a cold one.